Many practitioners are concerned that the efforts they make in their daily life are not considered practicing. In actuality our whole life is practice and everything we do is a reflection and actualization of our intention to follow the Bodhisattva Way. For this reason we cultivate compassion, wisdom and skillful means in such a way that our life will help alleviate our suffering and the suffering of others. How this happens is through a process of formal practices within the context of the zendo, such as sitting zazen, chanting, ritual, work and lectures. When we are not honing our skills at the Zen center, there are daily practices that are important to maintain wherever we are. 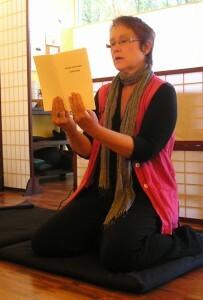 It is very important to have a practice that includes a teacher(s), a sangha and the true Dharma. We cannot come to realization without the help of all beings. Having said that, it is also essential that we understand practice does not end when we leave the formal temple or Zen center, but that we must continue our practice throughout our day. Zazen: Find a quiet place in your home: a corner, a closet or a room, in which you can spend a few minutes in meditation every day. It is important that you can spend this time uninterrupted. The timing of your zazen will probably depend upon the timing of your family. This is a mirror of the reality that we all live interconnected lives. It’s not a problem, just a condition of your life. When you can find the place and the time, sit down and meditate. One important aspect of this practice is that you stick to your schedule. Even if you squirm around or feel that you are getting nowhere, please just sit down and stay on your cushion for the amount of time you have designated for meditation. Please talk with a teacher to ascertain the best way to do this. Chanting: There are several chants that you can chant daily for yourself and others: the Heart Sutra, the Enmei Jukku Kannon Gyo for Protecting Life, and the Verse of the Universal Gateway. When chanting we always end by dedicating the recitation of the chant to all beings. Home Altars: Home altars give us loci for our devotion. 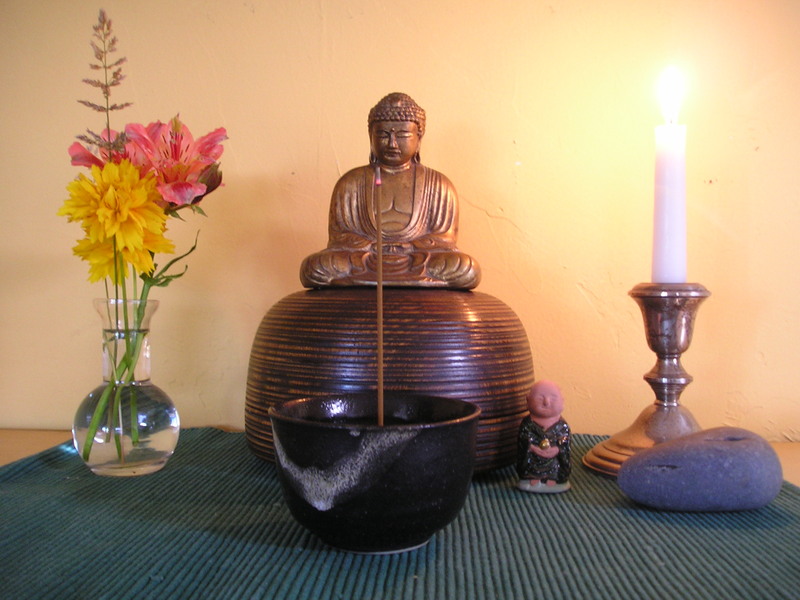 A Soto Zen altar includes a Buddha figure (statue or picture), candle, bowl to burn incense, and flowers. The altar represents the center of the Buddhist cosmos, or the heart of your home. You can offer incense, meditate and chant in front of your altar. You can offer a bit of food at the altar when you eat, to signify your gratitude to all the beings that make your meal possible. 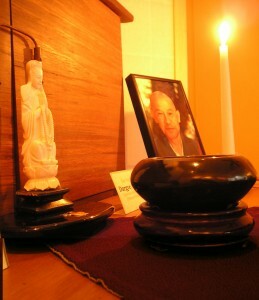 You might place pictures of deceased loved ones on your altar (to the left and right of the Buddha). Placement of the objects are: The Buddha image is on the top shelf in the middle, the area below the Buddha tier will have room for the flowers (on the left), an incense bowl (in the center) and a candle (on the right). Below that level might be where you keep your bell and sutra book. In general, the altar space is a place for you to personalize and make sacred your devotion to the three refuges: Buddha, Dharma and Sangha. It should have deep meaning for your faith and reflect the objects that are meaningful to you. Other kinds of home practice include, tracing the sutras on paper, and reciting verses while brushing your teeth or other daily activities.